The famous seaside resort of Blackpool contains some of England's most celebrated landmarks, many of which date back to Victorian times and feature traditional red-brick architecture. 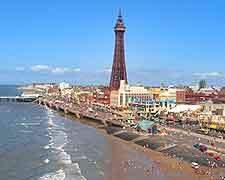 One of the town's most eye-catching sights is without doubt the Blackpool Tower, while the Golden Mile and its glitzy amusements is equally impressive. 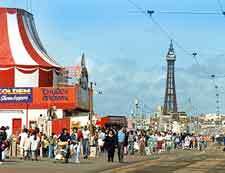 Other prominent landmarks in the town include the three piers (North, Central and South), each of which comes with something different, including fairground rides and restaurants. The Winter Gardens entertainment complex comprises no less than 12 different venues and plays host to the annual eight-day ballroom dancing competition known as the Blackpool Dance Festival, which began here in 1920 and now attracts in the region of 1,500 couples every May. Also of note is the majestic Grand Theatre (National Theatre of Variety) along Church Street, part of which was built in the late 19th century. 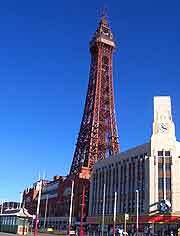 Known for being based on the famous Eiffel Tower in Paris, the Blackpool Tower is known throughout the world and was built at the end of the 19th century, being finally completed and opened in 1894. The tower lies off the Promenade and at the northern end of the Central Drive, next to Church Street. Towering more than 155 metres / 510 feet, this is one of the town's most iconic landmarks and is lit by approximately 10,000 light bulbs during the seasonal illuminations. Beneath the tower itself, a large Victorian-style building is home to a host of attractions, which include the Tower Ballroom and its enormous Wurlitzer Organ, with the final of BBC1's Strictly Come Dancing often filmed here. Further highlights include afternoon teas at the ballroom, performances by the Tower Circus, seahorses and lobsters at the Undersea World Aquarium, and plenty of family fun at Jungle Jim's Adventure Playground. No visit to the Blackpool Tower is complete without a trip on the dinosaur ride, on the third floor. Also be sure to enjoy the views from the top, where you will find the Walk of Faith, which features a glass floor. A true extension of the seafront and beaches, the Blackpool Golden Mile is famous throughout the country for its seemingly endless line of amusement arcades, gift stores, cafes, fish and chips, tram rides and ice cream shops. The ultimate place to purchase a souvenir of your visit, which can range from a novelty hat or saucy postcard, to a T-shirt or simply a stick of rock, the Golden Mile truly is England's slot-machine capital. Many enormous leisure centres reside in this part of the town and feature the latest video games, using state-of-the-art technology. Most traditional seaside amusements are also plentiful, with coin-operated rides for children. Blackpool is home to three eye-catching and equally impressive piers, all of which are close to each other. The most historic of the three, the North Pier features a tram, a glitzy Victorian carousel and a popular Sun Lounge area overlooking the coastline. The North Pier Theatre also resides here, where many traditional seaside shows take place during the summer months. 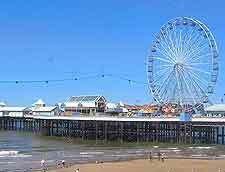 The Central Pier is the closest to the town centre and is dominated by a huge big wheel, which towers more than 30 metres / 100 feet in height and presides over the beachfront. Other highlights include the Cabaret Theatre, boasting plenty of family entertainment. The South Pier is especially appealing to those with a taste for thrills and excitement, since it is home to the exciting Sky Coaster free-fall tower and also the Skyscreamer, a reverse bungee where you can be fired around 45 metres / 150 feet into the air. The South Pier features a number of family attractions and rides, together with a bar area. A prominent and important historical landmark, the Winter Gardens is now Grade II listed and much of the structure was built in the 1930s, although theatres have been a feature in this part of Blackpool since the 1870s. 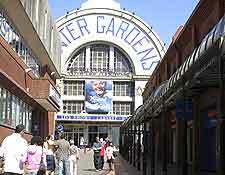 The Winter Gardens has become one of the biggest and most prestigious theatre venues in the whole of Europe and is regularly used for many annual conferences, concerts, banquets and musicals. There are 12 different individual venues within the complex, including the Arena, Olympia, Pavilion Theatre, Spanish Hall and Opera House, which can seat more than 3,000 people and regularly attracts many world-class performers and artists. Also extremely notable is the Empress Ballroom, where a variety of events are held throughout the year, including many dancing shows, competitions and rock concerts.